Hilo-born Major League Baseball star Kolten Wong has signed on as a spokesperson for Jamba Juice Hawai‘i’s latest line of fresh-squeezed juices. 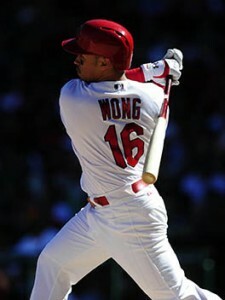 Wong played college baseball for UH Mānoa after graduating from Kamehameha School, and was the co-winner of the “2008 Hawai‘i Baseball Player of the Year” award. He was selected by the Saint Louis Cardinals in 2013 and achieved international stardom after hitting a walk-off home run in October 2014 that took the team to the playoffs. The second base big-hitter was selected for “NL Rookie of the Year” last December, hitting .249/.292/.388 with 12 homers, 20 stolen bases, 14 doubles and 42 RBIs in 2014. Wong is making his debut as an official Jamba Juice spokesperson on Tuesday, Jan. 13 at Maui’s Queen Ka‘ahumanu Center from 4 to 7 p.m. The company will introduce its new line of juices at this event before launching them island-wide this summer. Part of the proceeds on this day will go towards Maui little league baseball teams.